Some pieces of music represent beauty in miniature, within reach. Nothing against beauty in large scale, as in tall buildings, but one must value also beauty in small scale. Lagrima is one of these compositions. One of the reasons why it is so beautiful lies in its melody. But I would like to mention others less apparent ones. One of the cliches of Western Music is the use of major and minor modes to help transmit emotions. The major mode (as in C major) is more proper to convey joy, whilst the minor mode is more proper to convey sadness. Using the notes of each of the more proper mode is enough to easily carry the desired emotion. But Francisco Tarrega, in Lagrima, subverts this commom-place. The music has two parts (the first one is repeated at the end, therefore, the composition is in A-B-A form). The A part, the first one, is sad, while the B is happy. Although most composers would prefer the easiness to write the A part in minor mode and the B in major mode, Tarrega does exactly the opposite, using the major mode in a sad melody and the minor mode on a happy melody. Every time I make a more technical comment of a composition (as the one above), I’m asked if laymen also listen to it or only those with a good musical education do. It’s true there are aspects of a composition that even those with a strong musical background can’t capture (being a little unfocused is enough for it to happen), but things so structural, as a whole section being in a mode different from the one associated with the conveyied emotion, everybody listens to. The difference between a “regular person” and the musicologist is that the later can make a dense paper explaining every dot in every i, while the first knows “there’s something different here”, but can’t recognize or know what it is, the reason why. Other beauty lies on the generosity of the composer in writing a sophisticated, exquisite piece containg a challenge on the domain of the musical language but also accesible to guitarists who are learning the first notes on the instrument. With rare exceptions, like the piano, one of the main problems that still today many musical instruments face is the lack of quality repertoire from the very first lesson to the first concert. Through the way, unfortunately, a music student must deal with poor music, just because it develops some technical aspect necessary for one’s evolution and being closer to the demands the “great repertoire” imposes. I believe this is one of the aspects that contribute to making enthusiastic people giving up playing music. If more composers followed Tarrega’s example, studying a musical instrument would be a much more enjoyable experience. 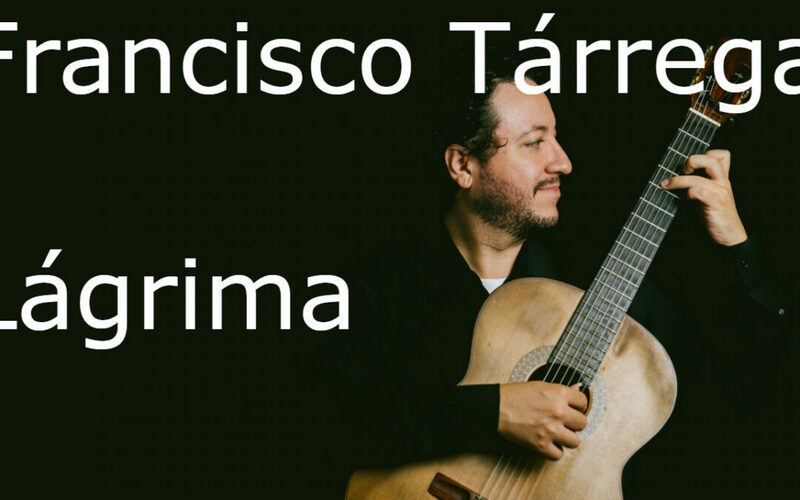 There are other reasons why I consider Lagrima, by Francisco Tarrega, a masterpiece in miniature. But these two are enough, and I don’t believe it is necessary to write a musicological paper to convince anyone of that. Listening to the music is enough. Anyone who hears it may not be able to explain why, but can capture that this simple music, of few seconds, has a different spice.